In 2015, the year came to an end for us on a high note as we celebrated the Christmas season with our Australian friends in Adelaide, the fifth biggest Australian city and capital of South-Australia. It was indeed a delight to be able to enjoy the atmosphere of family festivities as we had been away from home for quite a long time already. We have extremely well been welcomed and looked after. Originally, let’s say that the story of this encounter with our Aussie friends is beautiful, a madly beautiful one and this has been on for almost (already) 20 years now. So, we were all together as a family. And I confess we have been spoilt beyond imagination. And among the many attentions we were treated with, we were invited for lunch at the Orana Restaurant. This address, located in the very central Rundle Street, serves a fine cuisine made with native products from the bush with indigenous flavours. Surprising, isn’t it? Our curiosity was at its best, and let me tell you we haven’t been disappointed. We enter the restaurant thanks to a flight of iron stairs along a red brick wall on the right side of an old-style building proudly showing « 1982 » on top of its facade. The entrance seems deliberately discreet, as if to give a bit of a privileged side to the place. On the front door, the name of the restaurant – “welcome” is one of the indigenous languages – invites us to come in. A waitress shows us to our table. The service is faultless, almost learnt by heart. The atmosphere is classy, modern and intimate; the furniture, retro chic. The colours are gentle, rather close to earth tones, so as not to contradict the cuisine. Nothing could disturb our tasting, not even the freezing breeze from the air-conditioning that contrasted radically with the austral mid-summer heat from the outside. Each course is designed to be eaten in appetizing nibbles, delicate spoonfuls, soft or crunchy bite-sized pieces and parades on earthenware and wooden dishes. It is crisp, it softens, and it melts in the mouth. Everything is done to seduce the eyes and the palate, and to challenge our senses. We think we know this taste but then, as we are chewing, we are not sure anymore. We start having a doubt, and we end up with the eyes half-closed and our senses over stimulated. Our lunch begins with a series of appetizers, all the more surprising the ones than the others, like a macadamia cream flavoured with native thyme, a wonderfully soft bun to be laid on a bed of red embers before being eaten, or even some squid with native raspberry leaves. It’s a succession of curiosities that opens the curtain to a series of culinary stories in four acts. Then a piece of art made of kholrabi (a variety of cabbage), quandong (red fruit with a stone that tastes like peach and rhubarb), eucalyptus and lemon myrtle sets the tone. Thin slices of kangaroo meat cooked rare incredibly well follows with some gubinge (native plums), herbs and wild garlic. This dish is perfectly well balanced, tender, delicate, flavoured. Not a word is spoken. Our taste buds are convinced. The black-faced Suffolk lamb came juicy and decorated with ruby-coloured saltbush berries, along with smoked potato and leek. Then dessert came; we had a quenelle-shaped buttermilk cream floating in a sauce made of strawberry vinegar and eucalyptus. A sweet and sour explosion! Coffee and truffles. Curtain down. Except from the Blanc de Blancs Champagne that is served with the appetizers, all the wines are from Australia. As surprising as it can be, no Shiraz is on the menu. A too strong taste? A too easy choice? Or just not adapted to the dishes? Whatever the reason is, the selection is brilliant, the association is perfect as if dishes and wines would dance in a close embrace. Another delight full of subtlety: each wine is delicate and offers a nice progression to the palate. It opens, reveals flavours, gets rounder. It gets stronger or on the contrary, stays discreet. This lunch was a great moment, full of culinary surprises, new and unknown flavours. Knowing our weakness for curious and creative tasty cuisine, made with delicious and natural products, we couldn’t be happier. Indisputably, the Chef (and Manager) Jock Zonfrillo uses these ingredients with brio. He showed a great creativity while creating those amazing dishes with flavours both anchored in the earth and subtle. It’s a journey, as well as a game, an entertainment. 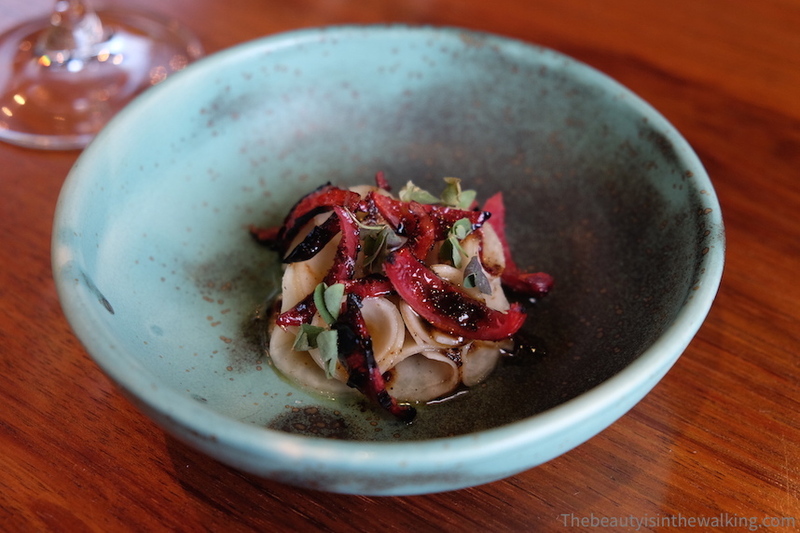 Orana Restaurant celebrates a bit of the Australian identity, its flavours and native tastes coming from this land, and in this way also provides a support to indigenous producers. Great thing. This is an experience to consider seriously if you come to Adelaide, or if you are not too far from it or close enough. A huge thank you, Dear Friends. On the ground floor, there is a more informal and affordable address owned by the same chef: it’s called Street-ADL, a bar-restaurant with a more energetic and casual atmosphere. Vérone and Erik, I think you have a new career as food writers. My mouth is watering. Maybe we will go there for my birthday but I will need to tear Robert away from the Shiraz! Hihi! Great to read that, Marion! Wonderful occasion for your birthday. I’m sure that Robert will love the experience as well, with or without Shiraz. Next PostFancy some Australian neo soul? Listen to Hiatus Kaiyote!